New York: Dover, 1978 148 pp. Small folio. Some wear to extremities, text block clean and white. Sonatas and partitas for violin alone, no. 1-6, BWV 1001-1006, edited by Alfred Dorffel. 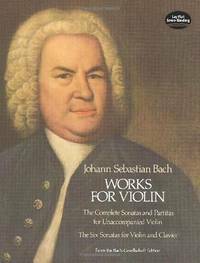 Sonatas for violin and clavier, no. 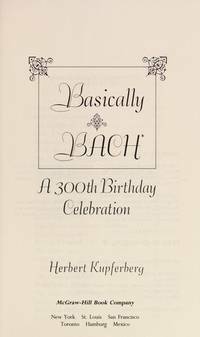 1-6, BWV 1014-1019, edited by Wilhelm Rust. 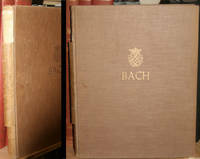 Facsimile of volumes 27 and 9 of the Bach Gesellschaft edition.. Wraps. Very Good. 9'' X 12''. 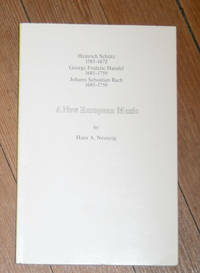 Bonn: Inter Nationes, 1985 103 pp., illustrations. Perhaps some sunning to spine.. French Wraps. Very Good. 8vo - over 7¾" - 9¾" tall. New York: Oxford University Press, 1966 xi, 382 pp. genealogy. table, music, 8 plates including facsimiles, portraits. Stamp of P.O., Spine of dj sunned, small tears and wear. Book with wear at extremities. 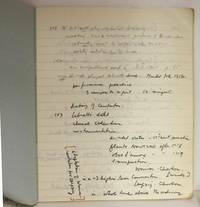 Plus notes of musicologist Saul Novack in blue book, laid in, regarding the cantatas.. First Edition, Second Printing. Very Good/Good. 8vo - over 7¾" - 9¾" tall. Blacklick, Ohio, U.S.A.: McGraw-Hill, 1985 viii, 198 pp. : illustrations, portraits. . Inscribed By Author. Fine. Kassel: Barenreiter-Verlag, 1954 xii, 288 pp. Top of backstrip missing, part of backstrip detached. Brown cloth rubbed. Good. BA 5001. Bright gilding on front board.. Cloth. Good. 4to - over 9¾" - 12" tall.